Exterior Alfa Romeo 4C Spider is a real highlight of this car. However, if we recall the history of the development of an automobile company, then very often its cars were criticized, while other people often admired what the Italians produced and designed. 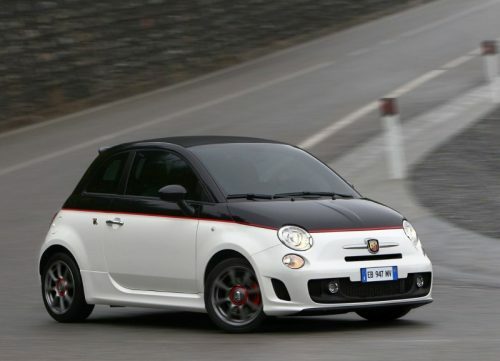 Based on this, I want to describe the appearance of an Italian car as objectively as possible. The nose has a short hood and original oval optics, which in turn in most cases resembles the sports cars of the German company Porsche (for example Porsche Carrera GT or Porsche Boxster). There is also the presence of a powerful bumper, which holds in itself a unique lattice of false radiators of triangular shape, large air intakes. It is clear that all this looks quite unusual. Only after considering the front of the car you begin to understand why there are so many disputes around the cars of the company Alfa Romeo. The lateral part of the car has powerful cases of exterior rear view mirrors, which were installed on large legs. Also, you can see the unique doors with attractive stampings and strokes, which perfectly poured into a massive air duct. Presence of ideal radiuses of arches of wheels successfully finish an image, however do not give the chance to form the unique response which concerns the given car. They can fit 17 or 19-inch wheels. As a separate option, you can order in which color the brake calipers will be painted. There is the presence of black, red, metallic and yellow. By the way, it should be noted that the body itself can be painted in one of 7 colors. The forage has no less strange appearance due to the incomprehensible shape of the trunk compartment, the fry bumper with diffuser, the non-standard optical system of light amplification, which look a bit like the rear lamps of the Nissan GT-R. By the way, it will not be superfluous to mention that they now have LED performance. Optionally, you can order a different sports exhaust system Akrapovic. In reality, to describe the appearance of the Italian convertible is not so easy, because it is too unconventional and not similar to any cars of modern automotive industry. 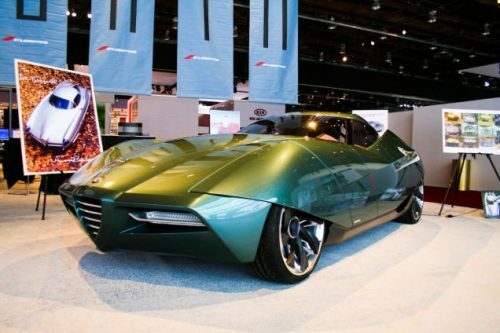 Accordingly, just for such characteristics, many like the Italian company Alfa Romeo. Italians do not use existing standards, they design the most unusual, albeit controversial, machines all over the world. 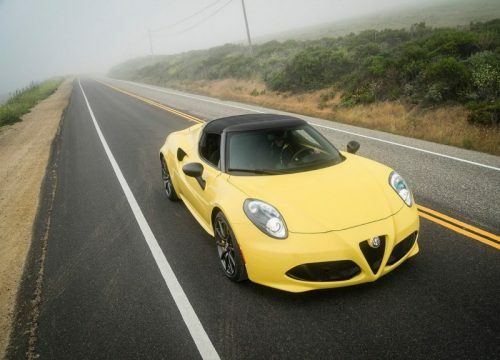 If you compare the car with the 4C version, then the convertible got only a removable roof. The Italian cabriolet has the following actual figures of its dimensions: Alfa Romeo 4S Spider length is 3,998 mm long, 2,000 mm wide, 1,810 mm high, and 2,400 mm wheelbase. Getting inside the interior of the Alfa Romeo 4C Spider, you immediately understand that it is a complete match with the external appearance – everything is unique, strange and original. Seats have clear sports notes and the required degree of lateral support. Manufacturers performed elements of high quality materials. Pleased with the presence of the electric drive settings, which adds only these seats additional advantages. It was nice to find a pedal box, which is made of aluminum. It may look strange, but the steering wheel turned out to be a regular form, although the multifunction was expected. Nevertheless, it received a natural undercut, which can be found in sports cars and decoration with high-quality leather. On the same steering wheel is the gearbox control. It’s nice that the steering column is adjusted in height and depth. On the front panel flaunts a large electronic display, which displays basic information about the machine, speed mode, fuel consumption and so on. Located in the center console, received decorations in the form of impressive air ducts, control units of the climate system, audio Alpine system and other options of the machine. Electro-acoustic option provides the ability to connect multimedia devices: calls via Bluetooth, support for the USB connector, the interface for iPod and CD / MP3. Moreover, the Alpine radio system provides access to HD and Sirius XM Radio. It is interesting that the console installed in the center is slightly deployed to the driver’s side, which is a very wise decision and simplifies control and access to various keys and controls. It will not be superfluous to mention that the Spider was designed around a monocoque, which in turn was made of carbon fiber. Similar was used in the 4C version. When the question arose about the roof, the engineers decided to perform it from the fabric, which allowed to significantly reduce the weight of the entire structure. But about the automated folding and unfolding the roof will have to be forgotten – since now all these actions are carried out only by mechanical manual method. Italian engineers and designers have thought of everything and manning it in the luggage compartment will not be difficult. But here, too, could not do without a fly in the ointment – a similar design of the fabric will take up and so a small free space in the luggage compartment, which is equal to only 100-liters. Such transformations made it possible to increase the mass of the convertible by the most insignificant 10 kg. 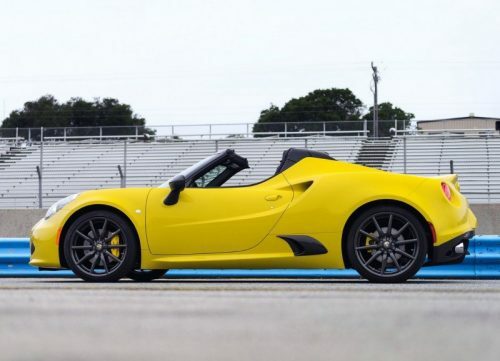 Therefore, as a result of all the modifications, the total weight of the Alfa Romeo 4C Spider is only 905 kg. And speaking in general, the interior of the Italian simply inspires the world of racing and was designed to synchronize a greater degree of stylization with functional details. In addition to leather, in the salon of the Italian cabriolet you can find Alcantara and Carbon. In more expensive modifications on the top of the central panel, a small multimedia system display has taken its place. Standard equipment has a parking sensor, as the visibility of the Alfa Romeo 4S Spider is not ideal. The salon will make it possible to feel comfortable even for high passengers. To help and so small luggage compartment comes a niche, located behind the backs of the seats. Rearview mirrors and power windows have an electric drive. As security comes 4-re airbags, the option of stabilization and a service that monitors the pressure in the wheels. 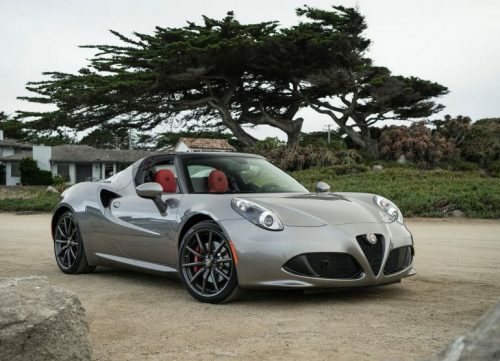 Speaking about the technical component of the sports car Alfa Romeo 4C Spider, it should immediately be noted that there are no special innovations if you compare the car with a variant. Spider, just like the 4C model, has the presence of a turbocharged petrol power unit, which has in its arrangement four cylinders, a volume of 1.75 liters. Despite such a modest amount, the engineering staff was able to extract 240 horsepower and 350 Nm of torque from it. All the torque goes to the rear wheels. This is achieved thanks to a robotic gearbox with six ranges. The latter, by the way, is equipped with a pair of clutches. Questions on the dynamics of the machine will not arise. 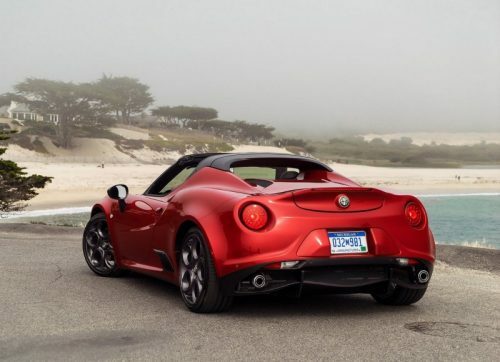 The first hundred is achieved by a sports car in 4.2 seconds, and the top speed is 258 km / h.
Many sports cars have different driving modes and Alfa Romeo 4S Spider is no exception – it has 4 modes: Race, Dynamic, All-weather and Natural. Moreover, there is a track package of options for the car, in which there will be other shock absorbers, different wheels (in front there will be 18-inch wheels and 19 behind them), a sports steering wheel, another dashboard panel and carbon overlays on rearview mirrors. As an option, you can buy a sports exhaust system with a sonorous Akrapovic jump, as well as a removable top made of carbon fiber. It’s nice that the designers have installed the shift paddles of the gearbox shift in manual mode. 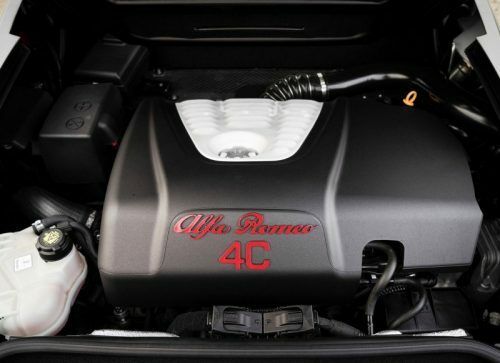 Speaking about the appetite of this power unit, it consumes from 5 to 9.8 liters per 100 kilometers. In the Spider version there is a beautiful balance and improved dispersal of the mass along the axes, rather than the version of the coupe. Due to the electric differential of the overestimated friction, the problems with excessive turning are receding into the background. Even if you disconnect the ESC, the convertible will not be easy to disrupt. While there is no information on the pricing policy of the Alfa Romeo 4C Spider cabriolet in the Russian Federation, but if translated into rubles, this price is approximately this: 6 000 000. A track package is immediately prepared for the car, which includes the presence of other shock absorbers, various wheels (ahead of 18 inches, rear to 19), a sports steering wheel, a different dashboard, and carbon overlays on rear visibility mirrors. Optionally, you can still purchase an exhaust system with Akrapovic sports content and a removable roof made from carbon fiber. The cost of the car. Summing up, I would like to note that again the Italian car company managed to create a model that will be vividly discussed. Everyone can find in it their own minuses and their advantages – all this is a matter of personal tastes and preferences. However, one thing remains – the car looks unique, sporty, fast and youthful. All these nice and refined lines, unusual design of wheels, front and rear lamps, front air intake – just will not leave anyone indifferent. Inside everything is Italian in a beautiful and at the same time quality. The presence of a display on the instrument panel and the second screen (available in more expensive trim levels) means that the company does not stand still, but rather wants to progress and develop to please any consumer. Quality of interior details at a high level, here you can include both leather and alcantara and carbon. If we talk about the power unit, then its volume can not be called “sporty”, however, nevertheless, it together with the turbine is able to deliver you a lot of adrenaline. After all, the whole point is that this car has a very “modest” mass – only 905 kg. And yes, it is there, albeit folded in a manual way, but still there is a folding top. 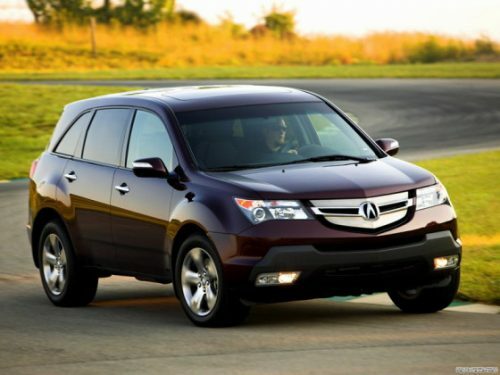 The quality of performance of this gig along with its driving characteristics will not leave anyone indifferent. A small fuel consumption will definitely save, although having a similar car, saving you is unlikely to affect. In the end I want to say that Alfa Romeo 4C Spider turned out very attractive.